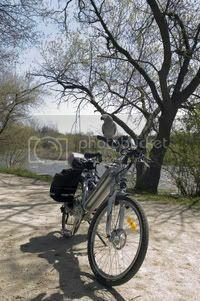 This is a thread where you can show off your favourite pictures of your e.bike ride. I'll start the ball rolling with my own electric assisted Hercules tricycle. 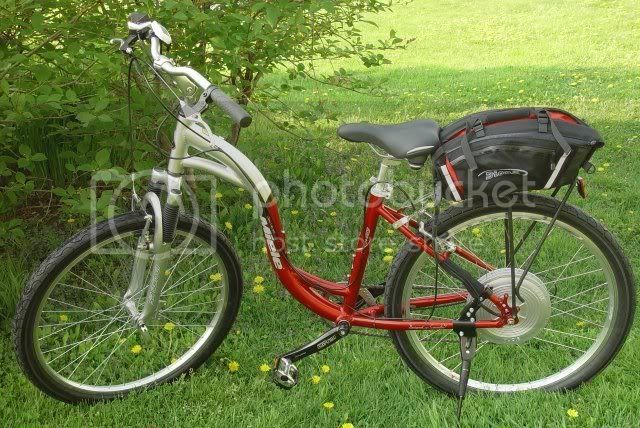 2005 Indian Hercules ladies roadster converted to a tricycle and fitted with a Motrax 250watt 24volt hub motor kit. Nice ride Sianelle, a really handsome and classic looking bike. I've heard of Hercules but never seen one. Is it native to NZ or Aus.? I'll try to post mine but have to reduce size. This is my "Porteur Poseur", a Worksman Industrial heavy duty which I chose because of my Clydesdale size. I use it for grocery shopping and other errands. Great fun! Location: Base of the Rocky Mountains, Canada. Wonderous things! Sianelle, that trike is really classy looking. I love the bike in general, let alone the brooks and the touring bag. The motor being in the rear wheel is new to me, as most of the trikes i've seen are powered via front wheel. Looks great though. I've not got much to show in the way of pictures as mine is disassembled due to winter and having a fairly worn out battery. Planning on doing a rebuild next year. Oh, I am doing some restoration projects on some vintage bikes though, if anyone wants pictures of those. Peugeot PX-10 and a McKinley Aventurier. Whats a McKinley? I dunno. Hey I like your bike jerryt, it's a really nice solid practical bicycle. How does it run with the 600watt hub? - I bet it can fair haul. Abneycat, my first trike, - a converted Raleigh, - had the hub motor wheel on the front, but I found after a fair bit of use that a utility trike works best if the push is where the load is. When I built up the Hercules I put the hub wheel at the back and I must say that it's a big improvement. The pedals on my trike only drive the left rear wheel, so having the motor on the right balances things out nicely. The left rear wheel is fitted with a Sachs 'Duomatic' hub and it's been really great and absolutely reliable. 'Hercules' was an English bicycle maker that ultimately was swallowed up by Raleigh. This Hercules of mine was built in India in 2005 and is just about an exact copy of my 1953 English Hercules ladies roadster bicycle. It's history is that it was purchased in India and used for touring around that country and then brought back to New Zealand whereupon it was offered for sale and I bought it with much glee. I'm curious Sianelle, regarding the left rear wheel skirt. What is its purpose? It's for muddy country roads when I'm pushing my tricycle from the left hand side jerryt. Until I fitted that rear wheel skirt to the mudguard I would get muddy stripes up my pants leg or on my skirt and stockings. I was very pleased with how that guard turned out actually since I made it myself and shaped it up with a tinman's hammer and an old shoe last for an anvil. Sianelle, that bike is wild There's a lot going on there. jerryt, that looks real comfortable. As soon as I get it going I'll put a pic up of my electric contraption. Most of the bits have been sorted, but need to find another 20" freewheel first. Very nice Zeuser. I'm not familiar with disc brakes. Does the brake stay on the frame when you swap wheels? Disc brakes have the brake caliper bolted to the front fork or the frame (rear) and the discs are bolted to the wheels. Bionx hub motors have the mounting points for disc brakes built-in. So the bionx rear hub wheel can work with conventional brakes or disc barkes. In my case my "Transformer" has 4 wheels total. That my friends, is the greatest bike i've ever seen. Surly frame (looks like an instigator), quality components, stokemonkey and xtracycle. Ready to handle the trail, the city, and those 12 cases of beer you need to drag along for your next party. Oh, some different tires for riding in the city too, of course. That is a really nice setup on that Surly and I'm sure you're not the only one who is wishing it was theirs. 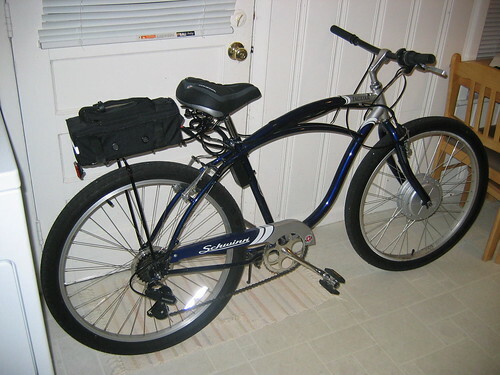 Schwinn Jag with a BD-36 kit. Mine have been seen a thousand times before. 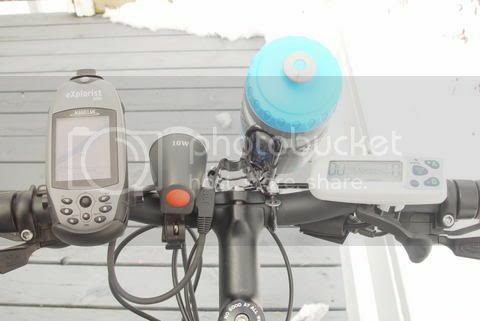 The picture shows my ebike when it was tested with temperary 48V battery. Later new two 12V 12Ah batteries are put inside the red bag as permenant setup. .
Last edited by The7; 12-04-07 at 04:11 PM. Well I hadn't seen your bike before AllenG so I was really pleased to see your pictures. These e-bikes are sweet, they would make for a dream commute when a little more speed is needed and/or mandated. Putting an electric motor on my bike has almost turned it in to my dream bike. (of course, I'm always dreaming about improvements-- I'd love to replace it with a weatherproof velomobile and get a more powerful motor some day... and add more "plug in and go" convenience). Things I like: the tires are flat-resistant due to their sheer tread thickness. The no-suspension MTB frame and rims are durable. 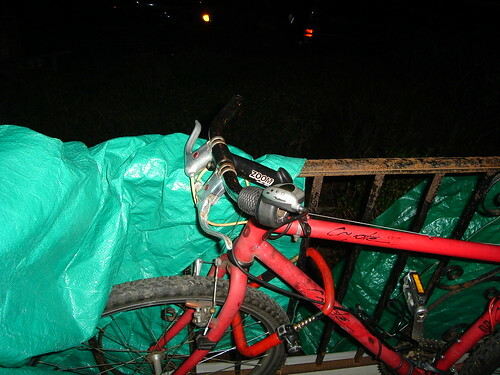 The storage compartment is waterproof, making the bike more practical in bad weather. 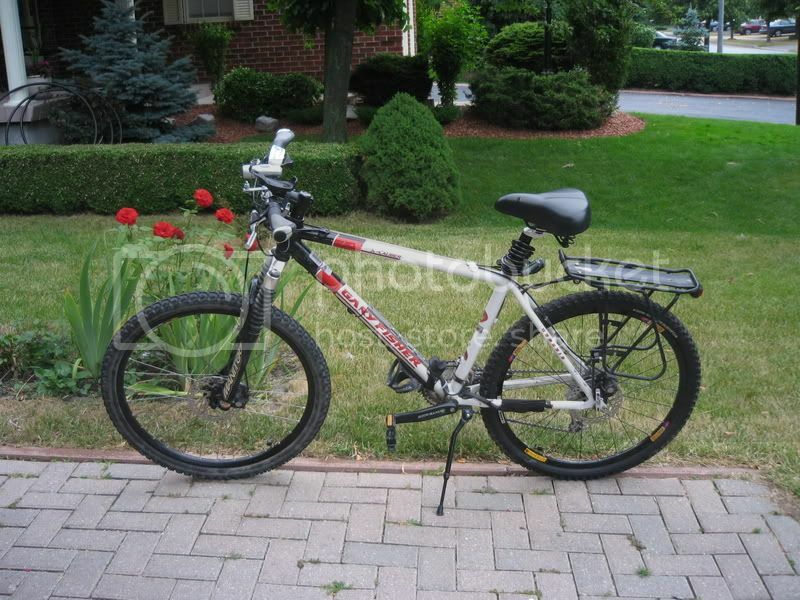 The bike's pretty light for an electric bike due to the lithium battery and relatively compact motor. The narrow curved handlebars help me avoid wrist and back discomfort. The seat has had its padding torn off and is now much more comfy. It's ugly as sin, hopefully won't get stolen. Cerewa is that a Cyclone motor? 350W ? Lithium is nice but has become real pricey for me. Have you ever had SLA for comparison? still has the SLA battery pack, but I will switch to a Li-CoPoly battery pack as soon as this one starts aging. I decided to go with lithium iron phosphate because it's actually very cheap on a per-mile basis. This is because you don't need as many amp-hours*volts to go the same number of miles, plus lithium iron packs tend to last for over 1000 charge cycles, while lead acid lasts for a few hundred. I've never had another ebike battery. 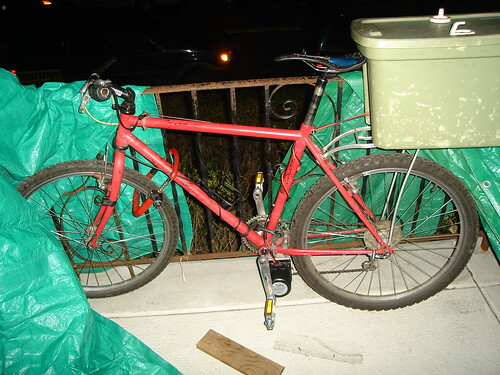 but for my use, SLA is a poor choice-- I live 17 miles from work and have to carry the bike up some stairs to park it. I feel like I got a good deal because I bought from www.yesa.com.cn for $330 and got a battery which I think will last 2 years in heavy use. (1000 cycles, 17 miles per cycle, 2 cycles per work day, which is about 1 cent per mile). If it only lasts 1 year I won't cry too hard as that will be 2 cents per mile in battery cost. With a lot of luck, it could last 5 years/2500 cycles! 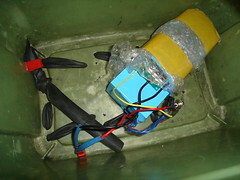 The motor is from cyclone and it's the 500w kit. Great kit if you want power on steep hills and on flatter ground. 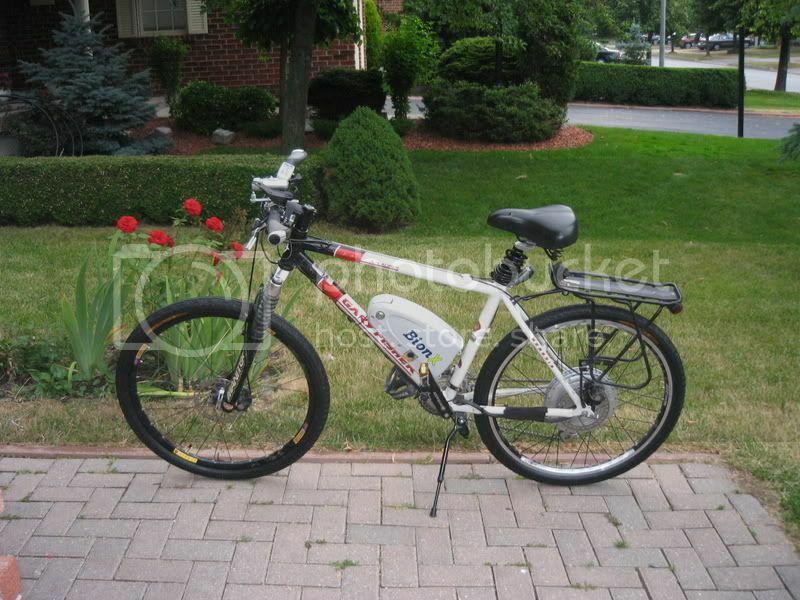 This is one of my electric bikes I have. I had this Motiv bike for a few years. I put a Wilderness BL-36 kit on it. I'm very satisfied with the results.